With time, the number of bookmarks increases and it really pains to manage a large number of bookmarks in the chrome bar. But there are a number of tweaks and chrome extensions that help to manage the bookmarks in a much better way. Here I have listed some of the simple tricks and extensions for quick and easy access to bookmarks in Google Chrome. This trick will definitely help those who do not wish to click on more arrows again and again to open other bookmarks that are not appearing on a chrome bar. Open Google Chrome control (three vertical dots) icon, Bookmarks>Bookmark Manager. On clicking the bookmark manager option, you get a list of all the bookmarks saved with the option to take more actions. Now here you can see the website text along with its favicon. Next, you need to click on the three vertical dots on the right of each bookmark. Now click on the edit option and you will get the following screen. You can see two fields here. One is Name and the other is URL. Just remove the text in front of Name field. You will be left with the only favicon. This way you can add more bookmarks in the bookmarks bar of Google Chrome. But remember you need to identify the website by its favicon. In the above method, you remove the text completely from the saved bookmark. Sometimes you are unable to recognize the bookmark just from its favicon. If that is the case with you, you can use this tagging option. Here you can tag the website by your own identification name. Open the bookmarks manager, and in the name field, remove the text and add your own name\tag after the hashtag. We often keep cleanliness at our home and workplace, then why can’t we keep the bookmarks folder clean by deleting the unused or old bookmarks. Just go through the list and be honest with you when analyzing each bookmark. Don’t forget to delete the bookmark that you have not used at least for two or more years. This is sure that you are not going to use them in near future. That’s for sure! The other tweak you can use to manage the bookmarks is the use of chrome extensions. Using them will surely increase the productivity at work by optimizing the bookmark search. Normally when you save a bookmark, the recent ones are placed to the bottom of the list and you need to scroll to the bottom to find it and it really becomes painful and time-consuming when you have a long list of bookmarks. This is where this extension is helpful. If you click on its icon (orange-star), you get a list of the latest bookmarks saved recently and the best thing is that all these are arranged in descending order. 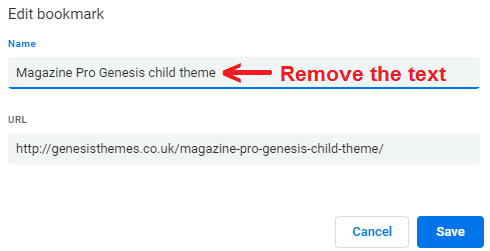 You also have the option to delete the individual bookmarks and moreover, you can also go to the Bookmark manager from the link given at the bottom of the list. As the name says, this extension does the sorting alphabetically in ascending as well as descending order. It sorts the bookmarks as well as the folders and moreover can also sort the bookmarks inside the folder. Apart from sorting the bookmarks, this extension does a lot more. It deletes the duplicate bookmarks and merges the folders with the same name. It can also remove the empty folders from the list. The best part of this extension is that it does all the bookmark management automatically. It is one of the best bookmark managers that sorts all the folders and bookmarks automatically, once you have down all the settings. With this chrome extension, you can sort the folders and subfolders of Bookmarks Bar, Other Bookmarks, and mobile Bookmarks. You can do the sorting in a number of ways that include alphabetical sorting in ascending and descending order, sorting as per newer and older date and sorting of URLs alphabetically. This is another extension from Google Chrome that helps the users to manage bookmarks whenever you open a new tab. Opening a new tab offers you a number of options on the new tab page. The page gives you the option to open Bookmarks Bar, Other Bookmarks and Mobile Bookmarks (with dropdowns) right from the screen. There are a lot of built-in and third-party tools when it comes to managing bookmarks bar in Google Chrome. You can keep the bookmarks bar tidy by organized by sorting them in various ways. Try them out and share your experience if you some other bookmarks manager tool.